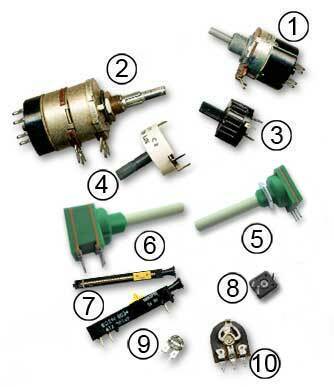 • Describe types of potentiometers and variable resistors. • Describe differences between potentiometers and variable resistors. Controls that produce a varying voltage using resistance are called either potentiometers or variable resistors. Although both types of control may be physically the same, it is the way they are connected that differentiates between the two types. A common construction is for the control to have three connections. One connected to a sliding contact called the wiper and the other two to either end of a fixed resistor called the track. The wiper can be moved along the track either by use of a linear sliding control or a rotary "wiper" contact. Both linear and rotary controls have the same basic operation. The schematic symbols used for potentiometers are similar to those used for fixed resistors except that they have an arrow to indicate the slider in potentiometers or variable resistors that are accessible to the user. In pre-set controls, available only from within the equipment - for use by technicians a ‘T’ shaped line touching or crossing the fixed resistor is used, as shown in Fig. 2.5.2. The name POTENTIOMETER (often abbreviated to ‘Pot’) is used when a variable potential (voltage) is obtained at the wiper terminal that is a fraction of the fixed potential across the track. The control is called a VARIABLE RESISTOR when the wiper is connected to one end of the track, effectively making it a two terminal device having a variable amount of resistance across the two terminals. In the potentiometer the resistance of the track remains the same as the wiper moves, and only the potential on the wiper changes. In a variable resistor the resistance of the track apparently changes as the wiper moves and short circuits more or less of the track resistance. The construction of variable resistors is very varied as many types are made for specific purposes. Although in much equipment potentiometers have been replaced by digital control systems, a wide variety of resistive controls are still used. Common applications for potentiometers are volume controls in radio or audio equipment and in joystick controls. The many varied designs are divided into two basic categories, often listed separately in suppliers catalogues as ‘Potentiometers’ and ‘Pre-set potentiometers’ (either of which can also be used as variable resistors). In this case Potentiometers usually refer to larger types having a control spindle that may be brought to the outside of the equipment it is controlling, normally fitted with a knob or slider for the user to adjust as part of the normal operation of the equipment. The smaller Pre-set types are intended for occasional internal adjustment only during initial set up or servicing by a technician. Volume control with a logarithmic track and double pole mains switch that switches both live and neutral power lines to completely isolate the equipment when switched off. Two independent potentiometers operated by concentric spindles. Used as volume and tone controls in old mains radios; the rear (tone) control has a linear track and the front (volume) control, a logarithmic track. The volume control also operates a double pole mains switch at the rear. Insulated preset with a low resistance wirewound track for high currents. The connection pins on this potentiometer are designed for soldering directly into a printed circuit board. Using a high resistance carbon track and insulated with p.t.f.e. to withstand high voltages, but at lower current than 3. For general user control use. Note the long insulated spindle that may be cut to the required length. Available in a range or resistance values with linear or logarithmic carbon track. Two potentiometers sharing a single spindle are referred to as being ‘ganged’ (What one does, the other does.) Intended for applications such as stereo audio equipment so both channels may be adjusted simultaneously. Two views of a precision slider preset, the wiper is made to slide slowly along the track by means of a screw thread turned by a small plastic gear wheel at the end. Provides a simple way of producing an accurately adjustable voltage. Insulated miniature pre-set potentiometer for use with voltages up to 200V, pcb mounting, usually supplied with a small plug in shaft to fit the hexagonal centre hole for easier adjustment. Typical resistance values range from 100Ω to 1MΩ. Skeleton presets refer to controls without an enclosing case. A basic track and wiper that can be adjusted using a small insulated adjusting tool, NOT a screwdriver! Intended for general setting up purposes and only occasional use. A larger version of 9. Both of these controls are designed for PCB mounting. Upright and flat mounting versions are available. Modern types are usually fully enclosed but this example shows construction and operation more clearly. Small presets may have either carbon or ‘cermet’ (a mixture of ceramic and metal) tracks.